This innovative baby shower gift package will amaze the prospective parents. It consists of a real share of stock that is custom framed, a personalized engraved plaque, and a cute XS t-shirt. Because the baby's name is not normally known at this point, you receive a framed color copy first, then the parents can provide the baby's name for registering the stock after the baby is born. 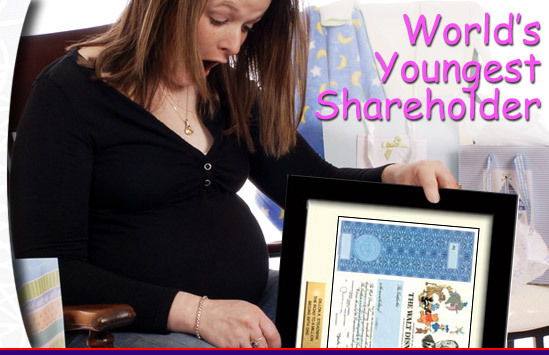 The baby becomes a real owner entitled to shareholder rights. This is a great baby shower gift from a group!